If you're tuning in today, but weren't here yesterday, simply scroll below to see Part I or click here. 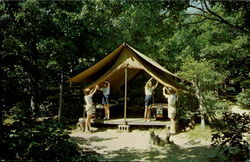 This is Part II of my exciting 12-year-old diary entries from sleep-away Girl Scout camp in East Hampton, New York. Not a whole lot of excitement went down according to these diary entries. Mostly a log of what I ate, seriously! My comments are in parentheses. I apologize for the lack of any real drama. The only scandal was that someone stole from some of the girls. I didn't even go into detail about it. I also recall my nerdy self and some other girls telling on some chicks who brought wine and cigarettes to camp. They were promptly sent home along with the thieves. Why this isn't in my diary, I don't know. I guess as a kid I thought a diary was for logging my food like a young Weight Watcher or something??? Duh! I hope I get a lot of mail. It's 10:22 am and my two towels are wet so I don't know what I'm going to do, I don't have another one. Lisa's singing in the tent, "I'm leaving on a Jet Plane." We all danced. Nancy is a very big, big jerk. She HATES boys. Man, she is weird! OK I have to go now. Everyone keeps telling me I look like a girl-Corey Feldman. I'm not sure why, but this did happen a few times, I honestly don't think I ever looked like him. Went rowing with some nice girls who were helpers in Highlanders. For breakfast I ate 2 hard boiled eggs and 2 slices of toast. Now I'm so hungry and it's 12:09 pm. I miss my mom. I can't wait to go home. I like Lisa so much. She's so nice. I cried before because Laura's Grandma died and she was crying so bad. Everyone is singing. I'm in the kitchen. Stef was here before and we cooked bread, cookies and eggs. I didn't eat it though. I slept at rest time for a half hour! YEY! We didn't have to swim today. No more swimming or boating EVER! Photos and descriptions of each camper! Breakfast: 2 boxes of Cap 'n Crunch, slice of toast. In about 2 minute we go to the final campfire. I'm all packed and ready to go. I can't wait!!! I made it one whole week! I'm going home in about 2 hours!!!!! It's 9am and I'm so hungry. We have brunch at 10. Our tent is all empty and laced up. I'm going to miss everyone except Andy the mean counselor. All the kids are taking pictures. Andy braided a lot of the girl's hair. I'm waiting for the bus in the parking lot. Nikki is crying her eyes out AGAIN! I really am going to miss everyone. It's now 12:44 and I'm on the bus. We all said our final goodbyes. I stole a box of Cap 'n Crunch for the ride and Rachel just gave me a marshmallow. Page gave me a friendship bracelet. At brunch I ate 2 boxes of Cap 'n Crunch, 1 egg, potatoes, 2 slices of toast. Just so we're straight, THIS was the Sean Astin I loved. You are cracking me up with the food talk and the "Sean Astin love." Hilar. I never went to camp, I wasn't an outdoorsy person and I hated nature and bugs and all that jazz. That who's who is just brilliant. You were one creative kid. Sean certainly was a cutie back then! I love how everything is soooo definitive –LOVE, HATE, SMELLS LIKE DOODY. That's the life of a summer camp kid for ya. Now I want Cereal. Damn you Ally and your tasty, tasty camp diaries! This stuff is just so cool! I love you go into detail on all your carb intake, so funny. What is even cooler is the fact that you still have all this...way to go! These posts are so priceless and precious! Love your diary. Thanks for sharing all the memories. Brings back good times for me, too. 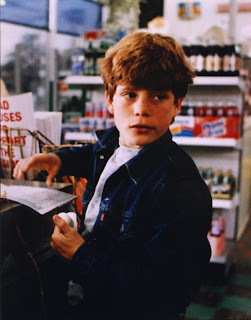 And yes, had a crush on Sean Astin back then, too! And, yeah, so is Nancy a lesbian now? I'm hungry after reading all that! I remember ants in the mashed potatoes, never getting a hot dog or a hamburger, and living mostly off snacks from the canteen we had to pay for...I never made my two kids go to camp! Craig worked at a sleep away camp in Connecticut a summer before I met him. I'm pretty sure he didn't have a diary, though. Ha! I think it's great that you kept your diary and have it to look back on, it makes me wish that I had something similar, if only to compare with the memories I have of my childhood. Looking forward to the gummy bracelets post! I Googled them and now know exactly what they are, I even had some when I was a kid, I just didn't know that's what they were called. Still, a little bit disappointed that they didn't turn out to be edible jewellery fashioned out of Gummy Bears. I giggled at the "Brand" muffin.....heehee. Hope that's ok! When you say 'two boxes' of cereal, I assume that it's those little one serving versions, right? If it were two large boxes…whoa and awesome. OMG Teach, yes! The tiny boxes, they were apparently very popular at breakfast at camp. I seriously loved the recap! The joys of summer camp! :) Thanks for sharing. This post rules. 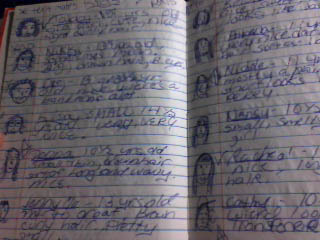 First, the fact that you actually drew little photos of everyone w/descriptions is AMAZEBALLS. And I love that you kept your diaries and stuff. I threw it all out (mortified I'm sure), once I moved out of my parents. Now I wish that I had boxed them up and kept stuff like that. i love how every day you reminded yourself that you loved sean astin!! that reminds me about how i used to write "doogie rules" after every note i wrote in middle school. What's In My Trapper Keeper? Tracey Gold! What's In My Trapper Keeper? Mikhail Baryshnikov!